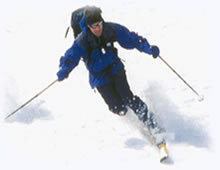 Telemark skiing is a term used for skiing using the Telemark turn which is a technique first developed by Sondre Norheim. It is also known as 'free heel skiing.' Unlike alpine skiing equipment, the skis used for telemarking have a binding that only connects the boot to the ski at the toes, just as in cross-country skiing. Remember, if you can't ski or ride well, it's not because there is something wrong with you; it's your technique. 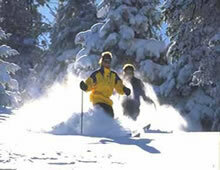 Alpine and snowboard lessons are available at all resorts. 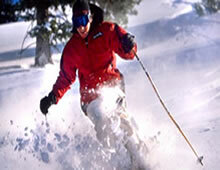 Telemark lessons are available at Big Bear Mountain and Mammoth. This is a great chance to improve your skills before you jump onto the slopes on your own. Whether you're aiming to become a professional skier or you prefer warm ski lodges and games of partypoker but don't mind a day of soaring down the sides of mountains, you can enjoy it more with good technique. Ask for instruction in skiing or riding ungroomed snow (the instructor will tell you if you're ready). The instructor will work on the basic skills: Balance, steering, pressure, edging, rhythm and flow. The Ski Mountaineers conduct training clinics each year, with professional instructors. There are many excellent alpine, telemark and snowboard videos. Unless you are a purist, as some are, you will get much more mileage. Skiing or riding can be taught in the backcountry, it's just slower (but cheaper). If you fall frequently, you have a balance problem. Without correct balance, nothing else will work. Take a lesson. A flexed athletic stance is essential. See the sketch above, which shows a proper telemark stance, flexed and facing downhill. When you flex properly, your ankles should be bent so that your knees are ahead of your toes. Do not bend at the waist; keep your back straight. Telemarkers used to be told to stick the front ski out to start a turn. This is not effective. It throws your weight backward at the beginning of the turn, just what you don't want. There are better techniques to try. Experts begin the turn without changing the lead ski, so that the downhill ski is ahead until the skis are in the fall line. To do this, start the turn before changing the lead ski. You can also try a sink into the tele position, or sliding the rear ski back rather than the front ski forward (this is quick in steep terrain). Do not jerk your skis around. Don't kneel on your telemark skis. Keep your rear ski only a foot or less behind the front ski. Keep weight on both skis (on the ball of the rear foot). Initiate by steering the skis downhill without changing the lead. If your inside (rear) ski seems to have a mind of its own, you don't have enough weight on it. Or you may be stemming and leaning on it. Don't do that. Keep your hands low, quiet, and in front. You often see telemarkers with their hands raised to the sky, like Charlton Heston playing Moses. We call this the "Nordic Prayer." Keep your hands just high enough to flick your pole forward for a pole plant (forearms level). Do not let your uphill hand get behind you at the end of a turn. Force it to stay downhill. One also often sees people with their hands high and the poles aimed forward, as if to spear a fish. This throws the weight back, and it is also dangerous; you can put a pole in your eye. Keep the baskets behind you until you need to plant your pole. Skiers should read the snowplow vs wedge discussion. Skiing is done with the legs, not the upper body. Your upper body should face the center of the next turn at all times, straight down the fall line for short turns. It helps to look at some object directly downhill. Aim your fanny uphill. This requires more twisting at the waist in the telemark than in the parallel position, because the downhill ski is ahead at the end of the turn. In the telemark particularly, keep pressure on the big toe of the front foot and the little toe of the rear foot to edge the skis correctly while turning. If you keep repeating the exercises in the ski tests, you will be working on fundamentals. Instructors can suggest other exercises. This exercise, called the mono-tele, helps alpine skiers learn to telemark and telemark skiers learn to ski parallel. Any equipment will do. Make a number of turns down the fall line on easy terrain with the same ski always ahead. Half the turns will be telemark, half parallel (but with the rear heel lifted on tele gear). Notice that you have to unweight to make the turns. It helps to stomp on the rear ski to initiate (pressure). Now switch the lead ski between turns. Practice with each ski ahead until it doesn't seem to matter which way you do it. Try it with the skis flat (steering), and also edged (edging). You can do this even with alpine boots (it helps to loosen the top buckles a bit).